Whereas stress fractures occur in normal or metabolically weakened bones, pathologic fractures occur at the site of a bone tumor. Unfortunately, stress fractures may share imaging features with pathologic fractures on plain radiography, and therefore other modalities are commonly utilized to distinguish these entities. Additional cross-sectional imaging with CT or MRI as well as scintigraphy and PET scanning is often performed for further evaluation. For the detailed assessment of a fracture site, CT offers a high-resolution view of the bone cortex and periosteum which aids the diagnosis of a pathologic fracture. The character of underlying bone marrow patterns of destruction can also be ascertained along with evidence of a soft tissue mass. MRI, however, is a more sensitive technique for the detection of underlying bone marrow lesions at a fracture site. In addition, the surrounding soft tissues, including possible involvement of adjacent muscle, can be well evaluated with MRI. 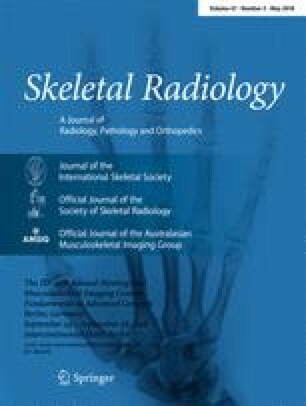 While bone scintigraphy and FDG-PET are not specific, they offer a whole-body screen for metastases in the case of a suspected malignant pathologic fracture. In this review, we present select examples of fractures that underscore imaging features that help distinguish stress fractures from pathologic fractures, since accurate differentiation of these entities is paramount.